The GTS tag first appeared on the first-generation Cayenne and 911, representing greater power and more responsive handling while retaining everyday usability. Based on the Panamera 4S, the first generation Panamera GTS of 2012 had a sharper, sportier image that placed it between the 4S and Turbo models. While the Panamera Turbo and Turbo S are supreme autobahn stormers, the GTS is the weapon of choice for a twisty road. In handling, engine response and exhaust soundtrack it is the most engaging steer of the Panamera range, a formula vindicated by the sales success of both the original and facelifted GTS models. Visually, the GTS stands apart through the black elements of the emphasizes Design package. The headlight lens background is black as is the rear light reflector strip between the blacked out taillights and lower rear valance insert. The 20-inch alloy wheels are also painted black, although alternatives such as black wheels with a polished outer rim, and conventional silver wheels are available too. The first generation GTS models were based on the naturally-aspirated 4.8-liter V8 powered Panamera 4S. However, for reasons of economy and emissions, the second generation Panamera 4S is powered by a twin-turbo V6 motor. As the GTS philosophy is based on a V8 and a sports exhaust that emphasizes its NASCAR grade growl, this soundtrack has been a Panamera GTS hallmark from day one. Retaining the V8 essence for the new GTS in the face of the downsized Panamera 4S V6 motor was essential, and the obvious solution was to use a detuned version of the 4.0-liter twin-turbo V8 that powers the Turbo. In line with the GTS ethos, the model specific sports exhaust has been tuned for optimum sound, especially when the flaps are opened. This is achieved either when the driver pushes the exhaust flap button on the center console or when Sport and Sport+ modes are selected via the steering wheel mounted drive mode knob. Thus the Turbo’s 4.0-liter V8 engine with two turbochargers nestled in the Vee between its cylinder-heads was transplanted wholesale into the GTS and its power and torque outputs detuned via the ECU mapping. Peak boost pressure is down from 1.3 bar to just 0.8 bar with no overboost facility. This means the GTS motor has a huge amount of headroom, which the engineers use to ensure the car can maintain its full performance at altitude. It also means that the cooling system is overspecified for the reduced engine output so track work in high ambient temperatures is not an issue. The new big numbers are 460 hp at 6,000-6,500rpm with 457 lb-ft of torque from 1,800 to 4,500 rpm. Helped by the unerring traction of the 4WD system 0-62mph takes just 4.1 seconds, with 100 mph passed in 9.6 seconds from rest. Top speed is 181.4mph. 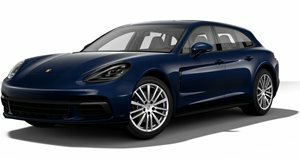 As with the other engine variants in the current Panamera range, there is a Sport Turismo GTS, so you can have a spacious daily driver with no compromise in driving enjoyment. Tipping the scales at 4,464 lb, the heavier and marginally less slippery GTS Sport Turismo (sedan Cd 0.31, ST 0.33) shares the sedan’s 0-62mph time, but takes 0.1 longer to get to 100 mph, and is 2 mph down in top speed. 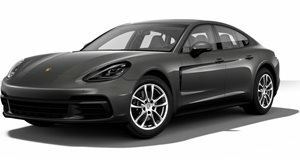 The Panamera 4S, GTS, and Turbo all use the same ZF eight-speed PDK dual-clutch transmission, with their respective clutch diameters sized according to power and torque. The 550-hp Turbo owns the beefiest clutch, with the GTS unit occupying the middle ground. The other half of the mechanical changes that meet the GTS formula lie in the suspension set up. The latest Panamera uses three-chamber air suspension to offer the widest possible range of settings from Comfort to Sport. The GTS set-up starts off 10 mm lower than the Turbo in its Normal setting with the bump stops shortened by the same amount so as not to compromise wheel travel. For ground clearance reasons on the road, there is a minimum safe height in Sport+ mode, which is the same for both the Turbo and GTS. Thus the GTS is lowered 18 mm in front and 10 mm at the rear in Sport+, with the Turbo dropping 28 mm and 20 mm respectively. The second generation Panamera has a radically different cabin from its predecessor. Both the GTS and its Sport Turismo sibling are based on the normal wheelbase car so cabin room is good but obviously not as spacious as an S-Class, A8 or 7-Series. But this is a more driver-oriented car, and the four seats with integrated headrests are comfortable with good all-round support. The dashboard with its big infotainment touchscreen is not just modern but also downright good looking with intuitive control buttons on the center console. Small details matter in a car of this class and we like the fact that the volume control for the audio system is a practical knurled roller knob rather than one of those silly digital controls that can be tricky to work accurately on the move. A new feature introduced at this time for all Panamera models is the Head-Up Display (HUD), one of the best systems we have encountered in terms of clarity. The GTS look consists of black leather seats with Alcantara centers, Alcantara headlining, and Alcantara steering wheel rim. An option is red seatbelts, red stitching for the seats, center console and dashboard as well as the GTS lettering in the headrests. These red accents deliver a splash of color to the otherwise monochromatic trim, while the optional carbon-fiber inserts for the doors, center console, and door sill inserts add further perceived value to this high-quality cabin. The handling of the more sporting GTS also benefits from uprated anti-roll bars front and rear. As with the Turbo, these are hollow to save weight and the GTS front bar is increased in diameter from 21.5mm to 24.0mm, while the rear bar maintains its 26.5mm outer diameter but uses thicker tubing to increase its rate. The overall effect of these changes is to reduce understeer, thus improving turn-in to bends, while the lower ride height reduces body sway over bumps and lowers the overall center of gravity for improved stability. Beyond these hardware upgrades, the other changes are all done on the electronic control applications. For instance, the standard fit PASM (Porsche Active Suspension Management) is set up to offer greater damper force resistance at any given point in its curve thus delivering a more sporting ride with no change in the overall ride character. This provides comfort through improved body control. The other application changes are in the PTM (Porsche Traction Management) system. With less torque being fed to each wheel by the detuned V8 the mapping has been calibrated to send a bit more power to the rear in Sport and Sport+ modes. This makes the car feel even more agile and sporting. As with other Panamera models active rear steering is an option and noticeably helps this big, heavy car turn in with a greater feeling of agility, while aiding stability at high speed. Our comprehensive test route to the Bahrain International Circuit took in town and highway driving where the Normal suspension setting displayed a high level of ride comfort despite the big 9.5J and 11.0J x 20-inch wheels shod with 275/40ZR20 and 315/35ZR20 Michelins. You can get 21-inch wheels as a factory option, but frankly the 20s are aesthetically balanced for the size of this car and are less vulnerable to road imperfections. The calibration of the three-chamber air suspension has been carried out to perfection and the GTS has a supple secondary ride with good low-speed bump absorption capability around town. The advantage of the tightened up damping curve is that Normal is now a good all-round setting for road use below the level where you want to drive aggressively on a twisty road and require Sport. The idea of monstering a big, heavy sedan around a racetrack has always been quite bizarre, but the Panamera GTS takes to the very technical F1 corners of the Bahrain circuit well. With Sport+ duly engaged, the slow Turn 1 going into Turn 2 sequence is the trickiest and most technical part of this track for a big, heavy car with little or no downforce. Keeping your speed in check and not being greedy with the throttle is the secret here, making full use of the 4WD grip before unleashing the whole power curve towards Turn 3. The rest of the track is fast and flowing and you can get a good rhythm going, just being patient in the two long medium speed bends where you have to hold the car on the edge with a constant throttle to avoid understeer or oversteer. The only other tricky bend is Turn 10 where you have to brake hard, initially in a straight line away from this slow, distorted U-shaped left-hander. As you approach the final turn-in point, your straight-line braking becomes trail braking as you apply some left lock before coming off the brakes as you turn into the tight left hander. You need to get your speed right down for this last bit, as carrying too much speed will result in understeer. If you miss the apex here it will screw up your exit speed, which in turn affects your terminal speed at the end of the subsequent straight. What was most apparent on track is just how wieldy and responsive this big, heavy car is in an environment that luxury sedans are simply not designed for. If anything, the long straights of this Formula 1 fixture showed up a relative lack of power to eat up the long straights, something the Turbo and Turbo S e-Hybrid make up for, but are less able to deploy because of their more comfort biased chassis settings. The new Panamera GTS is a fine luxury sports sedan that should continue the sales success of its predecessor. With no direct rivals, least of all for the Sport Turismo version, the GTS remains a unique proposition for Porsche enthusiasts who need a stylish, rapid and roomy daily driver that is also engaging to drive.